Having spent most of the summer doing a rain dance, I was suddenly regretting my urge to see the skies fall, as Storm Ali abated and Storm Bronagh picked up the mantle with even more gusto than its predecessor. It was the end of September and if the whipping wind and driving rain hammering the bedroom window wasn’t enough to keep me up, the prospect of a return visit to the River Wye to fish once again in the company of angling legend Bob James certainly was. The alarm was set for an ungodly hour but was unnecessary as I lay wide awake in anticipation of a weekend in Herefordshire with my dad in pursuit of barbel. A few early-autumn forays on my local rivers had been very kind and delivered a consistent number of barbel, so confidence was high. On the pre-dawn drive down from Yorkshire, I kept a close eye on the Environment Agency river level page for the area we intended to fish. Concern grew as the graph showed a massive spike that eventually surpassed four metres, as the deluge of the day before began to swell the river. Arriving at Bob’s HQ just a few miles outside Hereford, we made our way down to the river. We had fished the same dates the year before and the river then had been in perfect condition. There would be no such luck this time as the water level pushed to break the top bank. Knowing my dad is a creature of habit, I had a feeling he would want to fish a swim he caught several decent barbel from on our previous visit. Bob duly delivered us to the spot, but it was unrecognisable in comparison to our earlier trip, as the swell of deep brown water had covered all but the very tips of the top bank-side vegetation. 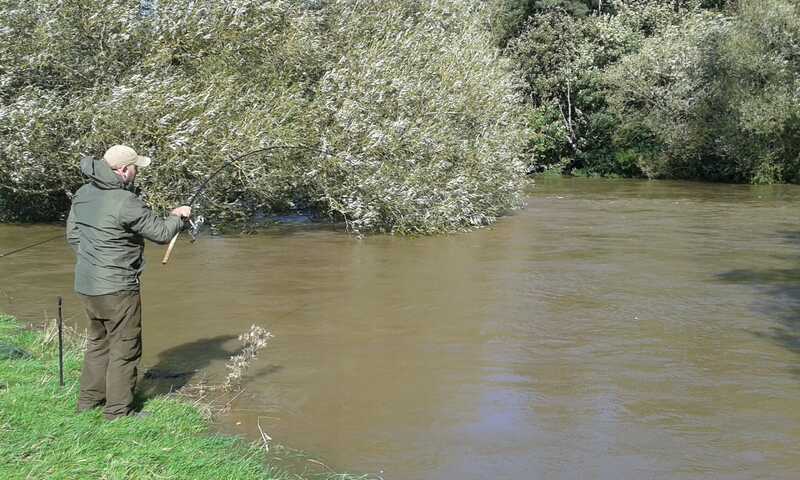 I could sense my dad’s heart sink and, if truth be told, mine did a little, as the prospect of fishing a heavily swollen and angry river wasn’t something I’d bargained on. “Come on, don’t worry about it; let’s see what we can do,” I said, as much for my own benefit as my dad’s. Not wanting to let doubt linger for too long, I set about trying to get some bait into the swim with the biggest bait dropper I could find in my bag. Having had a great deal of success in the weeks leading up to this trip with the Secret 7 range of baits, it seemed only logical to continue to use it and so, a day ahead of the trip, I had mixed a hefty amount of groundbait in the form of some freshly prepared hemp, Secret 7 stick mix, pellets and 8mm shelf life boilies. 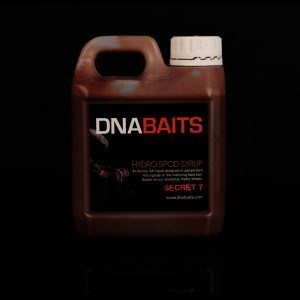 This was bound into a stiff and stodgy mix with a generous amount of the Secret 7 Hydro Spod Syrup and Hemp Oil. 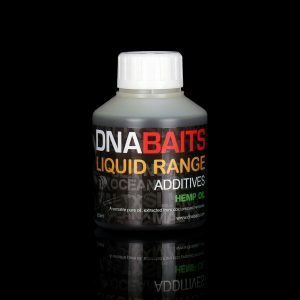 Allowing time for the bait to draw any potential fish into the swim, I dropped a liberal helping of groundbait into a couple of other spots to hedge our bets should we come up blank. Making our way to the original swim, I let Dad have first choice of spot. He opted for the downstream end as we both flicked baits out a short way and allowed them to swing back beneath our feet into the undercut bank below. We were actually fishing on the spot where we had been sitting on our last trip, such was the height of the water. Any doubts I had about our chances were more or less instantly dismissed as both rod tips registered aggressive bangs, tell-tale signs that chub were present in the swim. In under a minute, dad’s rod smacked over and a spirited chub of around 3lb was quickly netted. His face broke into a beaming smile and I breathed a heavy sigh of relief as I really wanted him to enjoy a trip as memorable as the previous one. The chub didn’t prove to be a one-off, as almost immediately as his bait came to rest on the riverbed his tip twitched and tapped, signalling there were further interested fish below us. The wind was thrashing across the valley with such force that the warm rain stung our faces as it pelted us relentlessly. 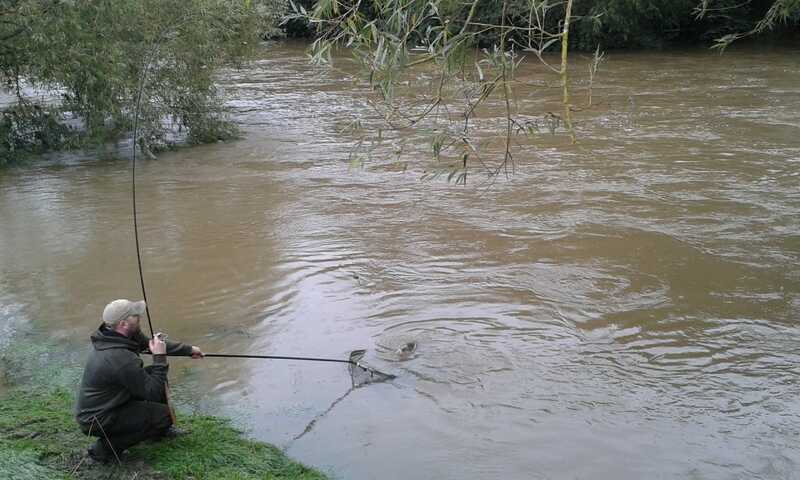 It would have been pointless to even attempt putting up an umbrella in such fierce winds, but in truth, neither of us paid too much attention, as the afternoon delivered a glut of bites from the voraciously feeding barbel. Dad was having a particularly productive afternoon, as I was confined to netting and photography duties. In such conditions it was always going to be a challenge to land any hooked fish, as they held position deep within the confines of the undercut bank. A move to one of the prebaited swims later in the day brought further action, but frustratingly the results were much the same as before, and I could only do my best to avoid the rod locking up as the barbel refused to move from the safety of their marginal hideaway. 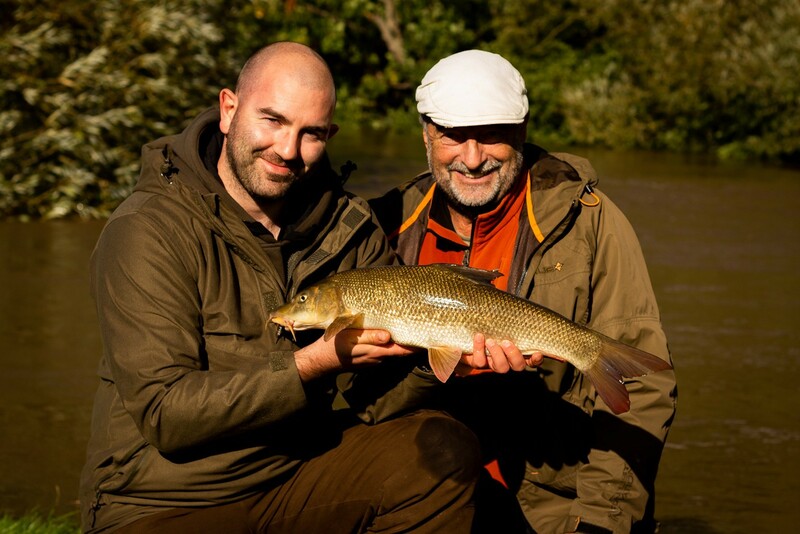 Finally, after half a dozen lost fish, the deadlock was broken with a modest but spirited barbel. 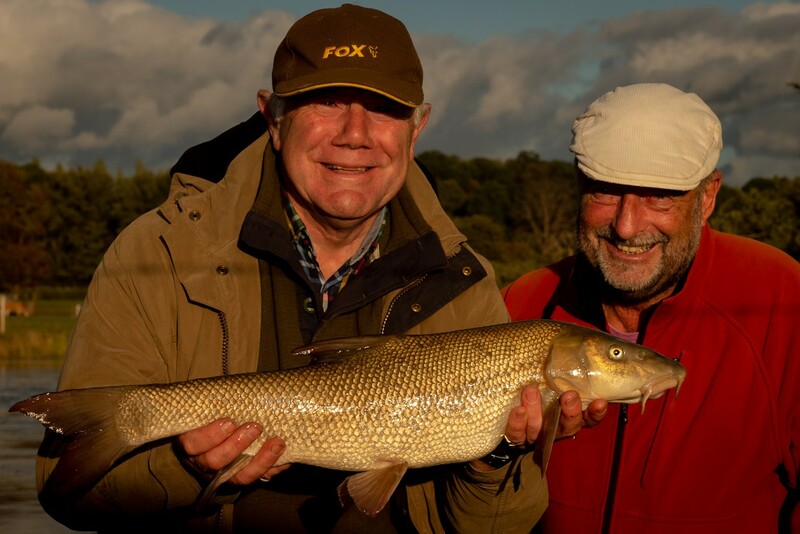 The afternoon brought a few more fish to us both before we decided to retire back to Bob’s static caravan for a hot meal, a change of clothes and an evening enjoyed talking all things fishing over a few glasses of red. The following day couldn’t have been more different. As first light crept over the Herefordshire countryside, a steady patter of rain drummed the roof of our static caravan lodgings. The wind, which had been utterly relentless the previous day, had thankfully abated and left behind a static layer of lingering grey, rain-laden cloud in its wake. Arriving back at the river, it had clearly dropped and was retreating at almost the same rate it had risen. This made things a little more favourable and, after repeating our prebaiting ritual, we settled into a swim that had been kind to me before. Anyone who has seen Bob’s exploits in his acclaimed series, A Passion for Angling, will know only too well how his tea-making skills have an uncanny ability to summon fish before the first gulp. True to form, no sooner had he handed me a mug than my rod tip arced over and I was drawn into battle. Initially it felt like another modest barbel but turned out to be an exceptionally conditioned early-autumn chub of exactly 5lb 8oz. Although it wasn’t the species I’d hoped for, this was a specimen of rare size for me and I only wished I’d caught it in the depths of winter, perhaps on a trotted float, when it would have doubtless weighed a considerable amount more and been classed a true specimen. Slipping the chub back, I barely had chance to blow the steam from my tea when the tip knocked once, then twice, as something cottoned on to the scent of my hookbait. 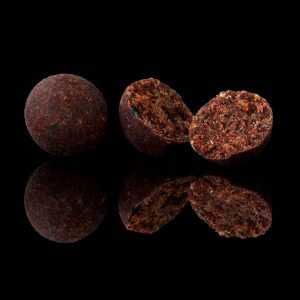 I’ve often used fairly standard 14-18mm baits in pursuit of barbel, but a recent switch in thinking, prompted by some insightful underwater filming by good friend and freshwater diving supremo Mark Barrow, had seen me opt for two 8mm baits wrapped in a loose layer of matching paste. 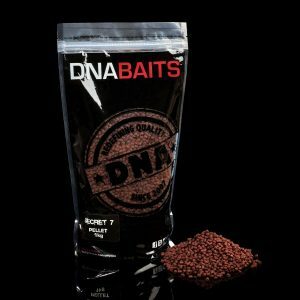 I have huge confidence in this bait configuration now, as I believe the two smaller baits present a far less obtrusive prospect than a single larger one and are met with far less suspicion. My confidence was certainly well placed when indications on the rod tip continued and it felt as though a bite was almost inevitable. 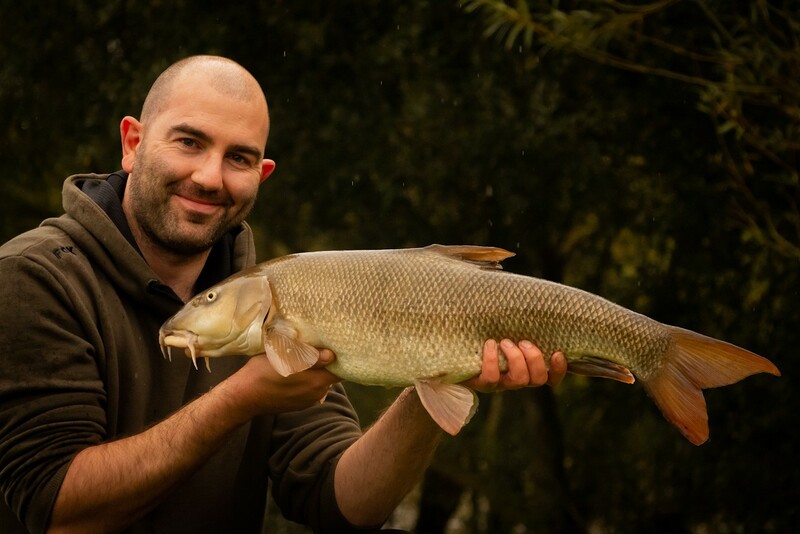 A heavy lunge of the tip saw me connect with my first barbel of the day. Its bullish demeanour and unwillingness to see my side of the argument suggested it was a decent fish, but with the water still being heavily coloured, it was impossible to gauge its size. As the fight continued, Bob uttered a cautionary word of advice to go steady; he clearly had a more accurate idea of how big it was. As the fish finally broke the surface, it did look a good size, but it wasn’t until the net was lifted that I realised it was more than likely going to break my personal best. 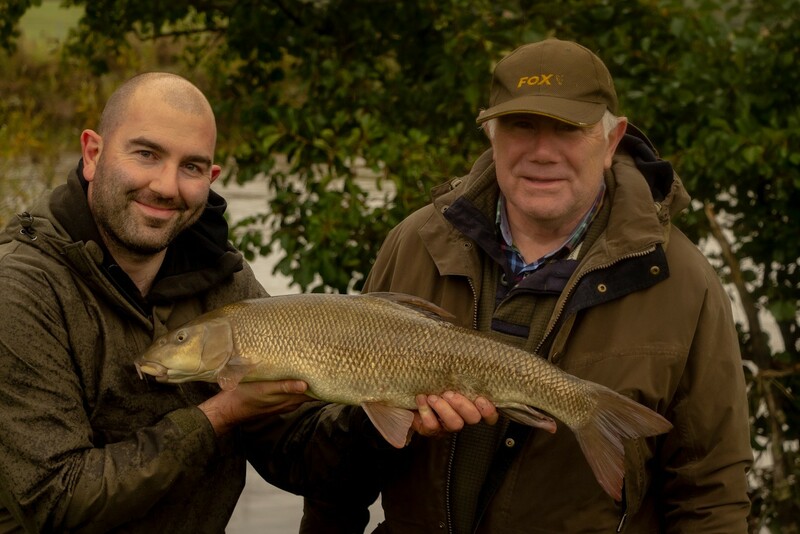 My first-ever double-figure barbel lay before me on the unhooking matt and sharing the experience with my dad and Bob was pretty special. Committing the moment to still images and film was a little surreal and my day was already made before it had even fully started. Quickly slipping the fish back, we persevered in the same swim, but after a short while it was clear the commotion had made any remaining fish a little reluctant to bite. Upping sticks we decided to fish two corresponding swims, and Dad was quickly back in his favoured peg without too much hesitation. Between us we caught some more scale-perfect barbel, with both of us getting to within a whisker of breaking the double-figure mark once again. In spite of initial reservations about the sudden and dramatic change of conditions, we caught incredibly well. Dad ended the trip with a round total of 10 barbel, myself with five and between us more chub than we could count. Had we landed all of the barbel we had hooked, we could have easily doubled our tally, but it didn’t matter all that much. What did matter was the experience we had again shared together with Bob and the fact that, despite the challenge we faced, we worked well as a team and enjoyed another trip that will live on long in our minds. There is little wonder the Wye is held in such high regard by anglers up and down the country, and I am happy to admit it is fast becoming one of my favourite angling destinations of anywhere in the world that I’ve been fortunate to fish. One thing is for sure, the rewards are there to be had. 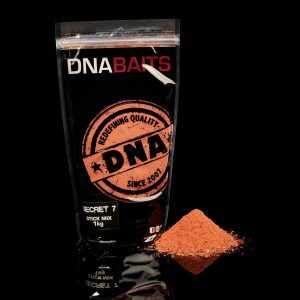 With the right approach, right bait and a bit of luck, there is every chance you could have a session as memorable as ours.